The National Museum of Health and Medicine in Washington, D.C. is one of America’s oldest and most respected institutions, but also one of its most forward-looking.With roots in the 19th Century—its collections include remnants of the remains of Abraham Lincoln, John Wilkes Booth and other key figures from the Civil War—NMHM is at the forefront of a 21st Century exploration of the cutting edge of museum science. The museum’s extensive historic, anatomical and embryology collections are now in the process of being digitized and made available online, which will be of incalculable value to medical researchers, pathologists, clinicians, forensic scientists and scholars in various other fields throughout the world. These digital collections, data archives and related computational resources will soon be housed in NMHM’s new satellite location in Chicago. 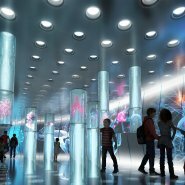 The National Museum of Health and Medicine Chicago, as it will be called, will function as a bridge between the physical and virtual realms. 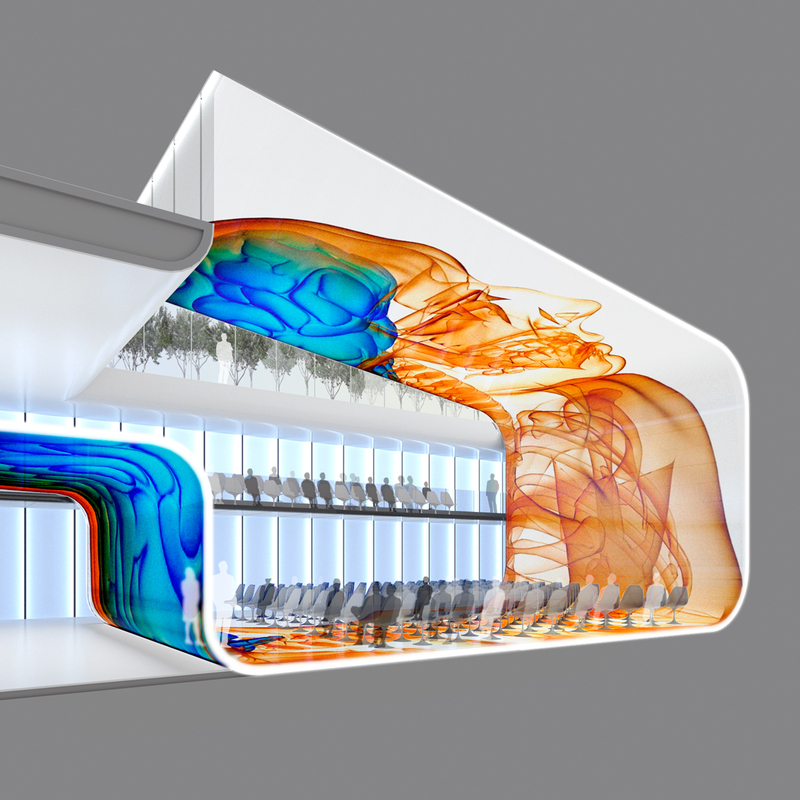 AS+GG is designing a new kind of museum that, in keeping with its purpose and theme, is itself a living organism, both metaphorically and in terms of sustainable energy generation. As they pass through the interactive interior spaces, visitors will uncover layer after layer of information about the human body. And like nutrients within a body, visitors will generate energy for the building via developing technologies such as a heel-strike system, which harvests the force produced by foot traffic. 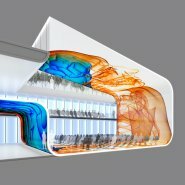 That power will then be visually expressed in various forms, on interior surfaces as well as on the building envelope. When the museum is lightly populated, for example, it will exude a quiet energy; when it’s buzzing with activity, it will visibly flicker and pulse with the physical presence of its occupants. The exhibit spaces will have a playful, fluidly sculpted, organic character, with walls, floors and ceilings flowing into one another seamlessly. 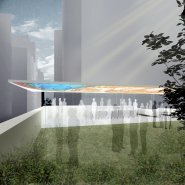 A signature feature of these spaces will be a plug-and-play system of display modules that can rise from the floor and/or hang from the ceiling, each module displaying actual artifacts with complex digital overlays. 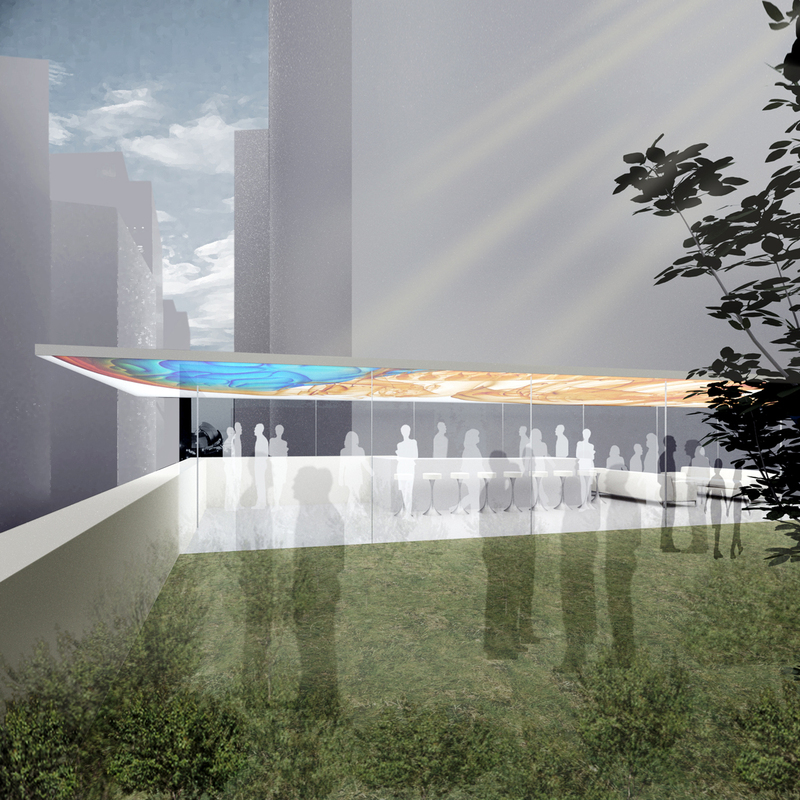 These modules can also act as portals into the museum’s virtual spaces. An important way that this facility will differ from previous museums will be the flexibility of the way exhibit content will be presented to the viewer. Virtually all of the interior surfaces of the building will be able to display visual and audio data. The dynamic configurability of these display surfaces will allow visitors to view individually customized exhibit content as they move throughout the building. When visitors enter the exhibit space, they will check out headphones with integrated RFID chips. The headset will allow the user to select from a variety of exhibits to view. As the patron moves through the exhibit spaces, his or her presence will be detected and tracked to allow the museum’s display surfaces to dynamically configure themselves to show the specific exhibit content to that visitor. The next visitor following along may see a completely different exhibit in the same locations throughout the building. 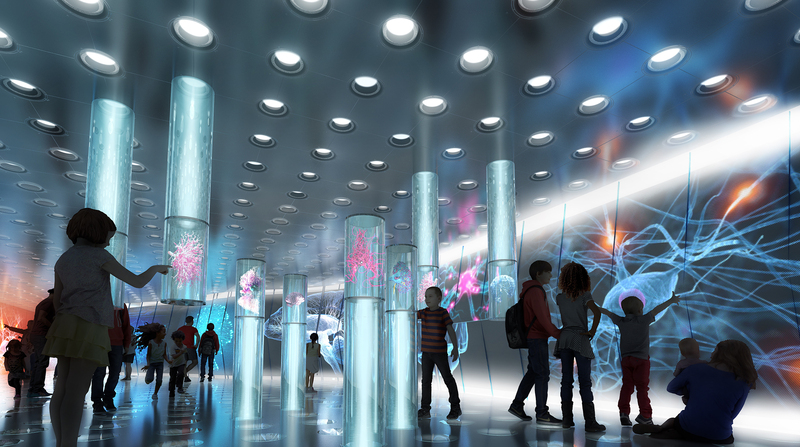 Elsewhere in the building, a virtual-reality chamber will allow visitors, including researchers, to interact with digital versions of biological specimens from the collections. One intriguing possibility is that viewers could view digital representations of brain activity or other organic functions as transmitted by sensors from a living subject. Other features include a 300-seat auditorium that will allow still and video images to be projected on its walls, ceiling and floor. 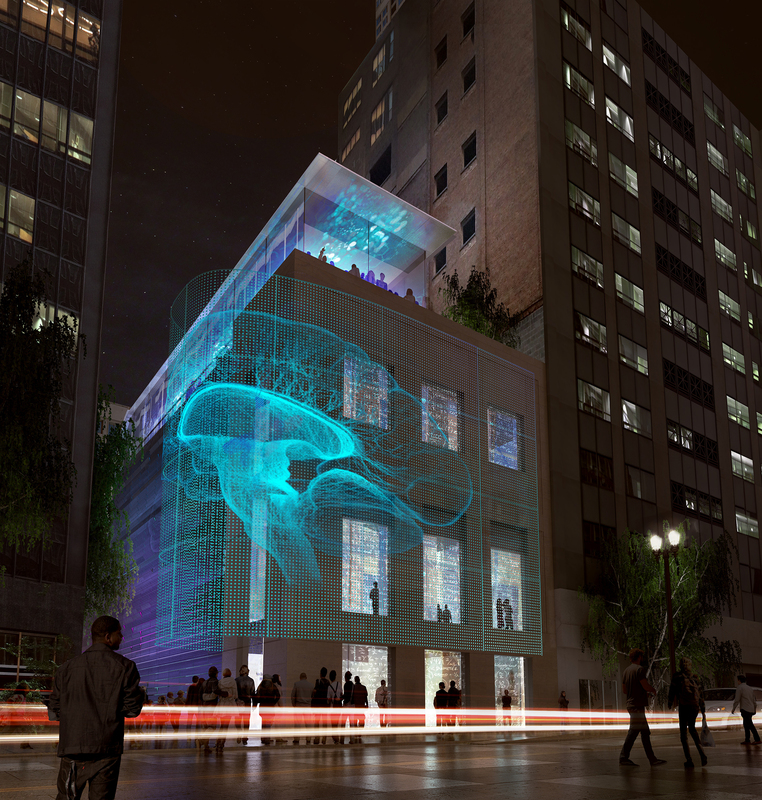 Digital imagery relating to the museum and its programming will be projected on a high-tech “wrapper” for the facade. Plastic surgery for the old Rock Records building: Will structure become a sustainable-and snazzy-$45 million medical museum?